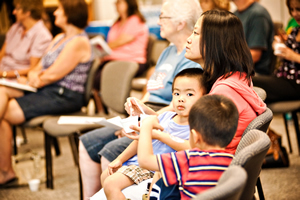 The Greenwood Public Library maintains public meeting rooms for library sponsored programs in accordance with its mission to enrich, empower, and educate the community. The following policies enable us to preserve these facilities for the use of our community. While library meetings and programs have priority for meeting room space, they are also available on a first come, first serve basis to individuals and organizations who meet the required criteria. Our community room policies are necessary to ensure that a reasonable atmosphere is maintained for those who utilize the library's facilities. It is also designed to allow a variety of groups a place to hold meetings so that a diversity of interests may be fostered and encouraged. Non-profit organizations (defined as having officers and set bylaws), as well as governmental, educational, student groups, and groups of educators (e.g. 4-H, Scouts, teachers/home school educators) are exempt from room rental fees. A $50 deposit will be collected from any group wishing to serve any food or drink other than water. If there are no spills or messes, the deposit will be returned at check out. Rooms may be reserved up to two months in advance. Monday - Thursday 9 AM - 8 PM; Friday 11 AM- 5 PM; Saturday 11 AM - 5 PM. Room rental fees may be paid via cash, check, or credit card at check-in. All meetings must end on time so that the room(s) may be prepared for the next event. Reservations should be canceled immediately if the room is no longer needed. No-shows will be charged the full rental fee. GPL reserves the right to charge full fees for cancellations made with less than 24 hours notice. No fees will be charged if the library is forced to close due to weather or other emergencies. The library reserves the right to cancel or move the location of a scheduled meeting. Every effort will be made to give at least one day's notice of any cancellation. Reservations must be made based on the expected attendance at meetings. Groups that number less than the capacity of a single room may not reserve the combined rooms. Exceptions to this rule will be made at the discretion of the director. Community rooms at GPL are available during normal business hours, but groups scheduled at the end of the day must vacate the rooms 15 minutes prior to library closing. Please allow set up time for your event--no early admittance is permitted. Rooms may be reserved from 9 AM - 7:45 PM Monday through Thursday; 11 AM - 4:45 PM on Friday; 11 AM - 4:45 PM on Saturday. Room A: A digital projector is available for checkout for this room. There is a projection screen. Room B: A digital projector is installed in ceiling for use with laptops. Cables to connect to the projector may be checked out at the patron services desk at check-in. A built in screen is available. Rooms A&B: When both rooms are reserved, the ceiling projector and screen in room B are sufficient for the entire space. A microphone system is available for Room B, or for Rooms A&B combined. In addition, each room has access to a sink, microwave, and refrigerator. Set up and clean up must be included as part of the group's rental time and is the responsibility of the person(s) or group(s) renting the Community Room(s). The fee for the use of the room does not include set up. The room must be left in clean, orderly condition. All tables and chairs must be returned to the default position at check out. All trash must be disposed of and food may not be left in the refrigerator. If additional trash cans are needed, please contact Patron Services. Future use of the room may be denied if these policies are not observed. Community Room capacity must not be exceeded. Smoking is not permitted anywhere in the building. Outdoor smoking must be kept farther than 50 feet from the entrance to the building. Alcohol is not permitted anywhere in the library building or on the premises. Open flames and flammable materials are not allowed in the Community Rooms. Illegal or potentially hazardous materials are not allowed in the Community Rooms. An appropriate number of competent adult sponsors must be present for groups of minors or young children. The library reserves the right to reject any application for use of the rooms which the Board of Trustees or the Library Director believes would disrupt the patrons of the Library or the providing of Library services to the public.